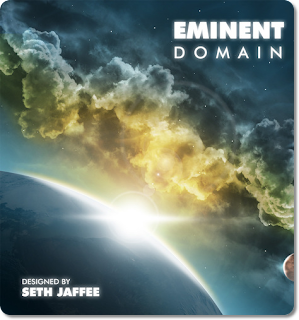 Eminent Domain brings pictures to mind of the Federal Government taking control of your land or property for the good of others, whether you like it or not. In this game by Tasty Minstrel Games, you are the government, or at least that is how I look at it, and you are claiming planets whether the inhabitants like it or not. Maybe not that dramatic, but Eminent Domain is a deck building game with a unique spin of having roles like the game Puerto Rico that keeps the game fast paced with minimal downtime between players. You have various actions you can take as the lead and other players can follow. Ultimate goal, get the most victory points before the end conditions of the game are achieved. Marty and I discuss the game in this 5 Minute Initiative and the anticipated release of the expansion to the game and what we hope is included to make this great game even better.